April 11 (Preview), April 12 (Opening Night) – April 28. Cousins Sam and Jaycee grew up together in a small Wisconsin town. Sam, who sharpened her bowling skills at the local alley, is now heading to college with a bowling scholarship. But Jaycee’s future isn’t looking so bright. As the young women and their friends face adulthood, the alley becomes a place to celebrate, mourn and forge new identities. But can their bonds survive even as their paths diverge? And is success always earned, or is it sometimes a matter of luck? Produced as part of the Big Ten Theatre Consortium’s new play commissions by outstanding American female playwrights. Think back to high school graduation – all the possibilities ahead. And then life strikes. 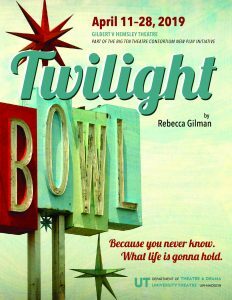 Check out this creative teaser by Theatre major Jake Prine illustrating this idea for Twilight Bowl. September 13 (Opening Night) – September 23. 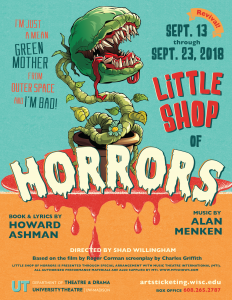 A sci-fi-horror-comedy-musical classic! Seymour, the meek employee of a struggling plant store, stumbles upon a one-of-a-kind plant that might save the shop. Naming it Audrey II, after his co-worker crush, Seymour discovers the out of this world plant can talk, sing, and has a taste for human blood! Can Seymour save the store, the girl, and, potentially, the world? The cast features Josie Brandmeier, Patrick Collins, Faith Fuller, Ana Gonzalez, Emma Grady, Gabe Hanna, Ben Jaeger, Brette Olpin, Bryanna Plaisir, Caitlin Rowe, Cobi Tappa, Maddie Wilinski, and Sam Wood. October 11 (Preview), October 12 (Opening Night) – October 28. 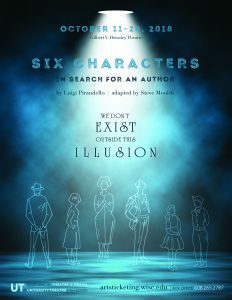 A troupe of actors are interrupted by a group of fictional characters, abandoned by their creator, demanding to be brought to life by a new author. The actors become swept up in the characters’ melodramatic story, causing the lines between reality and fiction to blur. The original “meta” theatrical experience is given new immediacy in this contemporary adaptation crafted specifically for the UW-Madison production. There will be an Opening Night reception featuring hors d’oeuvres and cash bar before and dessert after the performance Friday, October 12th. February 21 (Opening Night) – February 24. 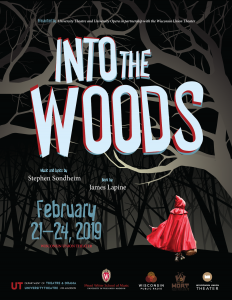 A co-production of University Theatre and University Opera in partnership with Wisconsin Union Theater, INTO THE WOODS is the celebrated musical that transcends your favorite fairy tales. Cinderella, Prince Charming, Rapunzel, Jack and the Beanstalk, Red Riding Hood, and other familiar characters find life is more complicated than “happily ever after.” Featuring glorious music and lyrics by the legendary Stephen Sondheim, this is a can’t miss theatrical event.